“It’s a marathon not a sprint”. The favourite line of football commentators, players and managers when they lose a game during the season. The season isn’t won or lost over 90 minutes but over the course of nine months. Technically that is true, but when it comes to play off time, then the previous efforts go out of the window and it all comes down to ninety or in some cases, one hundred and eighty minutes of football. The end of season play offs are the high point of the season. Two teams essentially fighting like gladiators in the Coliseum. Only one can walk away a victor, battered and bruised ready for the next opponent, whilst the loser has nothing but memories of a successful league campaign that ultimately led to nothing to console themselves with. 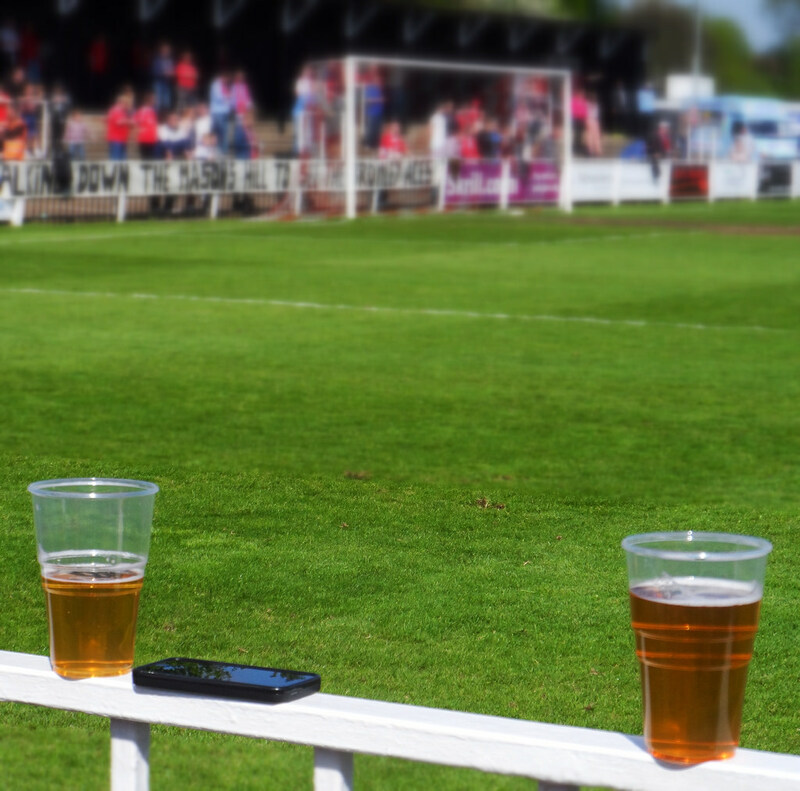 People who say the play-offs are unfair are either a) play-off losers or b) anti-football fans. Yes they are incredibly harsh sometimes. Take FC United of Manchester. In with a shout of the Evostik Premier title until the final day of the season, they finished 16 points above 5th place Ashton United this season, yet in front of nearly 3,000 home fans this week, they lost in extra-time. Their dream of moving up to the Conference North for the first time in their history was dashed by a 120th minute goal by Ashton’s Jack Higgins. In the Ryman Premier League, the teams finishing 2nd and 3rd, Bognor Regis Town and Kingstonian respectively, both lost their home play off matches this week. I can still remember the pain of 2004 in Cardiff when West Ham lost to Crystal Palace in the Championship Play Off final. 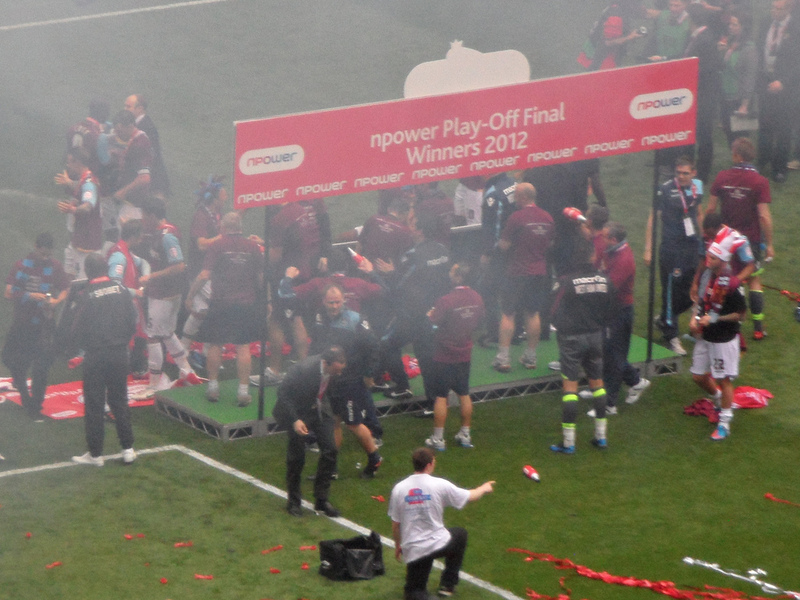 Palace had come from nowhere to sneak into the play offs at the last gasp and feeling the injustice of the fact that without the play offs we would have been promoted in third. The following season it was our turn to sneak in at the last-minute and were promoted after beating Preston North End having finished twelve points behind 3rd placed Ipswich Town. I’d still like to see a team from the division above thrown into the mix as it used to be the case when the play offs were first introduced into English football back in 1987. In that season Charlton Athletic had finished third bottom in what was then Division One, and then beat Ipswich Town, fifth in Division Two, to play Leeds United for the place in the top tier. After two 1-0 wins for the home sides, the game went to a replay which the Addicks won 2-1 after extra-time and thus retained their place in the top division. In the league below the story was slightly different as Sunderland were relegated from Division Two after losing a humdinger of a tie against Gillingham, who finished fifth in the third tier on away goals after a 6-6 aggregate score. There can be few things more dispiriting in football than being roundly beaten in the first leg of a play off game. On Tuesday night, Bromley FC, who had led the Conference South table for the best part of half the season, only relinquishing control for the last time in March traveled down the A2 to face Ebbsfleet United who only secured their play-off spot with two weeks to go. Bromley would have fancied their chances to have come away from Stonebridge Road with at least a draw, especially as their coach, Hugo Langton is a master of preparation and would have had a game plan nailed on. However, fate can sometimes be a fickle friend. Ebbsfleet opened the scoring after just 60 seconds and then less than ten minutes later Bromley’s Ashley Nicholls was sent off for deliberate handball and Ebbsfleet were 2-0 up from the resulting penalty. Two further goals proved the David Pleat theorists wrong in the perfect storm – i.e “Playing against 10 men is often harder than 11” and “2-0 is the most dangerous scoreline in football”. But Bromley do at least have a second bit of the cherry. Miracles do happen in football (just look at the fact Sam Allardyce is still in a job, or that Stoke City now play attractive football) so it was with the hope of a reversal of fortune that I planned my last Saturday of domestic action of the season. They were desperate to have a shot at the Conference Premier, having never ventured so high in their history. The excellent book, The Bromley Boys by Dave Roberts (coming to the silver screen soon) highlights the time when, in Roberts’s eyes, they were the worst team in England. They have got better since those days, and now with one of the finest Non League grounds in England, they had all their ducks in a row to have a crack with the big boys of the Non League. Ebbsfleet on the other hand were past masters of the Conference Premier. The one consolation they could take if they somehow lost this game was that they would have two local derbies against Dartford to look forward to, after the Darts relegation from the Conference Premier last weekend. But that would be a small moment of happiness. They drove up the A2, around the M25 and then followed the A21, making sure to watch the speed camera at the Michelin-starred Chapter One, with more than hope in their hearts. They could almost smell the final where Sutton United or Dover Athletic would be waiting. Bromley is only a bus ride away from TBIR Towers so it would be rude not to let such a potential momentous occasion pass by. The core of the LLF were also en-route, fuelled by Terry’s 50p off beer vouchers for Wetherspoon’s and the prospect of no footballing action in Sussex. The sun was shining so it was undoubtably going to be the best day ever. 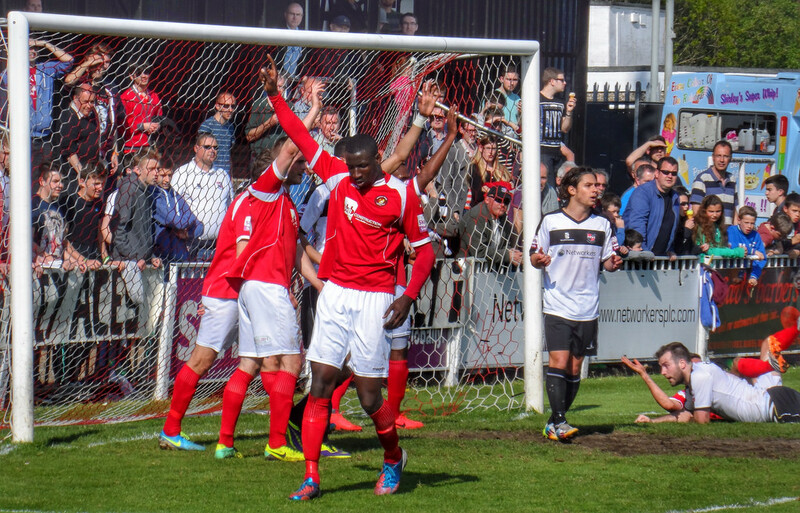 Bromley 1 Ebbsfleet United 0 – Hayes Lane – Saturday 3rd May 2014 This wasn’t a thriller to be honest. Both camps said as much in their post-match comments to the press. Bromley had to come out of the blocks flying and try to make an immediate impact into the four goal deficit. They couldn’t. The very big and strong Ebbsfleet defence held firm, using delaying tactics when they could to take the sting out of the Bromley momentum, whilst every so often using their wide men to push the home team onto the back foot. With a quarter of the game gone Ebbsfleet appeared to have taken the lead. A fifth goal over the tie would have had the fat lady on the pitch singing her heart out but the referee deemed that the scorer, Ben May, had used a hand instead of his head. Harsh from our angle. The scare seemed to shock Bromley into life and within two minutes they had taken the lead with a cracking strike from Danny Waldren. Every long journey starts with one small step – but would this be too little too late in the tie? Bromley really needed a second before half time to stand any chance of turning the tie around. Higgins went close with another strike from distance which Fleet keeper Edwards did well to push away but I think the visitors back four have had harder afternoons this season. The second half saw Ebbsfleet slowly start to press the Bromley midfield and thus back into their own half. The home side simply could create anything of note bar a Waldren header. Ebbsfleet could have had a goal themselves when the impressive McMahon fired his shot narrowly wide. A brief moment of hope appeared with ten minutes to go when Rance was given a straight red for his challenge on Goldberg but the numerical advantage lasted all of three minutes when Bromley’s Holland received a second yellow. Despite five minutes of injury time being played, Bromley knew the game was up. It had been a long, hard season where they had fought and won for the most part. Their fans stayed behind to salute the team, but the feeling of despair was clear to see as they slowly walked off the pitch for the final time this season. Ebbsfleet would now be hosting Dover Athletic in the Final, who had surprisingly beaten Sutton United 3-0 despite playing for 80 minutes with ten men.